5.0 out of 5 based on 147 ratings. The Course of Empire is a five-part series of paintings created by Thomas Cole in the years 1833-36. It is notable in part for reflecting popular American sentiments of the times, when many saw pastoralism as the ideal phase of human civilization, fearing that empire would lead to gluttony and inevitable decay. These Thomas Cole Course of Empire paintings are now housed at the New-York Historical Society, and comprise the following works: The Course of Empire - The Savage State; The Course of Empire - The Arcadian or Pastoral State; The Course of Empire - The Consummation; The Course of Empire - Destruction; and The Course of Empire - Desolation.The series of Thomas Cole paintings depicts the growth and fall of an imaginary city, situated on the lower end of a river valley, near its meeting with a bay of the sea. The valley is distinctly identifiable in each of the paintings, in part because of an unusual landmark: a large boulder is precariously situated atop a crag overlooking the valley.A direct source of literary inspiration for The Course of Empire is Byron's Childe Harold's Pilgrimage. Beautiful, original hand-painted artwork in your home. Interpreted paintings based on the masters' works of Thomas Cole.This The Course of Empire Destruction needs about 14 - 16days for production by a talented artist. If you're not happy with Thomas Cole The Course of Empire Destruction that you made on PaintingHere.com, for any reason, you can return it to us within 50 days of the order date. As soon as it arrives, we'll issue a full refund for the entire purchase price. Please note - PaintingHere.com does not reimburse the outgoing or return shipping charges unless the return is due to a defect in quality. If you want to purchase museum quality The Course of Empire Destruction at discount price, why not give us a try? You will save a lot more! 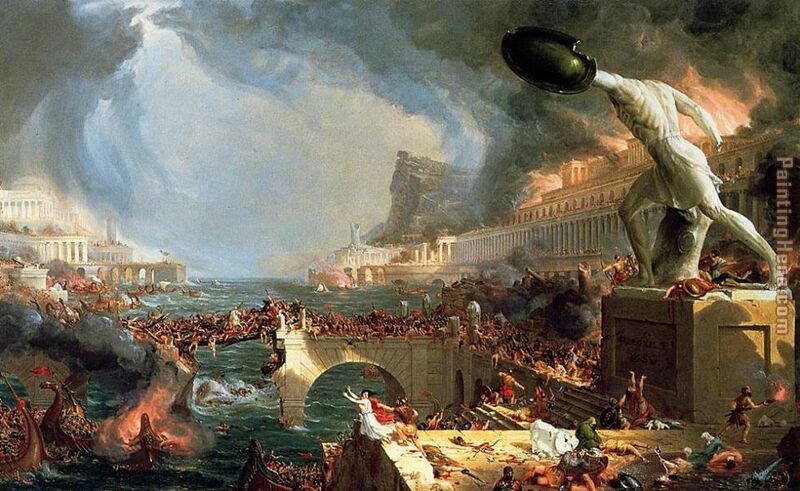 This Thomas Cole The Course of Empire Destruction needs 14 -18 days for production time frame. We ship all over the world. We can provide The Course of Empire Destruction Painting stretched canvas and large framed art.